Everyone is welcome to visit the cemetery when we are open. We are usually open from 10.00am to 4.00pm. On the dates shown below a team of Friends will be working in the grounds and any additional volunteers will be warmly welcome. 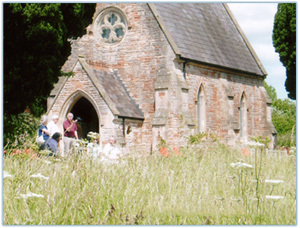 The grounds are maintained by volunteers as a nature reserve by The Friends of Mendip Hospital Cemetery. Birds and wildlife are found in abundance. The grass is cut each year in early autumn to encourage seeds to set and wild flowers to flourish. There are many spring flowers; cowslips, primroses and lady's smock among others. In the summer masses of different coloured valerian and foxgloves make a lovely show. Plenty of different grasses and shrubs encourage insects and butterflies which in turn attract the birds. A local sculptor has been using a chainsaw to convert fallen trees into art figures in the grounds of the Mendip Hospital Cemetery. 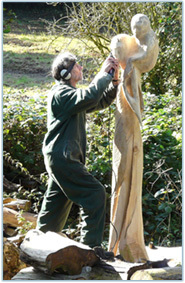 Several trees were blown down during a storm in 2008 and Peter Bolton has transformed some of their remains into sacred figures including a dancer and an angel. During the 85 years the Cemetery was in use, 2,900 burials took place, the last ones being in 1963. In the summer masses of different coloured valerian and foxgloves make a lovely show. Plenty of different grasses and shrubs encourage insects and butterflies which in turn attract the birds. 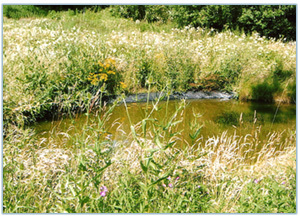 With an award from Wessex Water a pond has been created and is attracting frogs, newts and an occasional heron. The water lilies are flowering and there is a seat nearby to sit and enjoy the peace of this green space among the houses.